The following are concrete and earth-based wall systems that do not offgas toxins and are suitable for the chemically sensitive. Something a little different from the standard timber frame, fiberglass and gypsum boards. A mix of pumice and concrete are poured into forms to create these non-toxic walls. They can be made load bearing with a concrete beam. Test pumice for radioactivity and for odours that it may have picked up prior to installation. 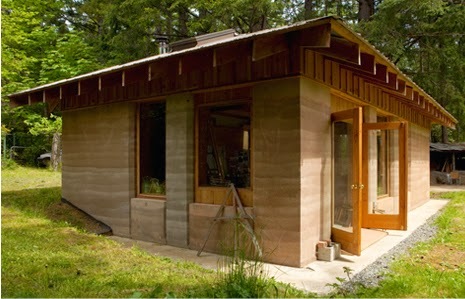 An interesting material making a comeback, HempCrete is blocks made of hemp and a lime-based binder. 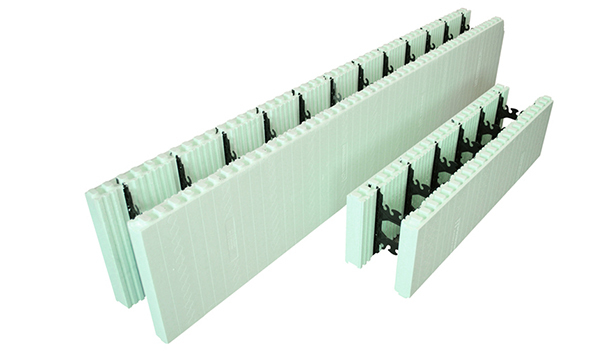 The blocks are used to form the walls and act as insulation. They are not load bearing so are used with a timber frame. Forms are made of a mix of remineralised wood and concrete. Inside, rebar is used as reinforcement and then they are filled with concrete. Insulative fibers can be added or they can be filled with part concrete and part clay or a non-toxic insulation. Brands include Durisol and Faswall. Faswall currently the only brand available in the US (2017). Concrete based blocks made from quartz, lime or cement, and aluminum powder. Test thinset mortar for sensitivity. Hebel is one brand in the US. It's not approved in California (2017). Nudura blocks (US and Canada) and Fox Block (US and Canada) are the most popular brands right now. 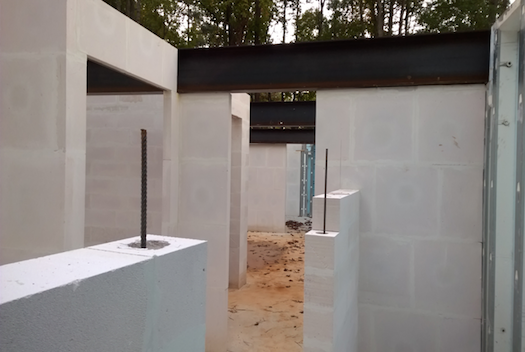 ICF could mean different types of foam with concrete fill, but typically it is EPS. See my post on Insulation for a detailed review of EPS. Nadura has a dye. Both have flame retardants. Portland Cement should be used and it should be confirmed that it is free of admixtures such as air entrainment and water reducing agents, accelerants and retardants, and super plasticizers. Ceramic Cement (Magnesium Cement) is also generally a non-toxic option. Which Concrete Aggregates are Chemical-Free? Natural non-toxic mineral aggregates should be used. Toxic aggregates include crushed brick, crushed sandstone, concrete slag, fly ash, cinder, and volcanic materials other than pumice. (Prescriptions for a Healthy House). Magnesium Oxide Board claims to be VOC-free but I don't believe that it is. They are a cement board that is more prone to cracking than regular drywall. People have run personal tests and found some of it to offas so I would test this against personal sensitivities. Many people have reactions. There are many new brands trying to fill the gap for well-controlled production, but there are also many problems coming to light. National Gypsum makes natural gypsum boards that are VOC-free (the paper backed ones). It's not always easy to source and I would rather not have paper-backed drywall. For easy to source wallboards that are GreenGuard Gold certified, try DensArmor plus, and Georgia-Pacific Gypsum board are all GreenGuard Gold Certified (Densshield tile backer not Greenguard gold). CertainTeed Gypsum boards and USG Sheetrock claim no VOCs. Research that a very sensitive client did reveal that USG was the cleanest gypsum on the west coast. Some gypsums synthetic and some are mined, and there are different additives used by different brands. For the super sensitive USG Firecode is recommended (it does not contain a flame retardent). AirRenew which is also GreenGuard Gold, claims to soak up formaldehyde. However, it contains a biocide which is likely not healthy. It is a little harder to source than the ones above. In wet areas such as behind showers, tub, and sink, cementitious boards should be used. MgO board, Durock (0-VOC), Hardibacker (Greenguard Gold), or Permabase. These are all different types of walls made of clay, straw, and sand. But instead of giving a comprehensive overview I will comment briefly on the suitability of these building materials for the chemically sensitive. 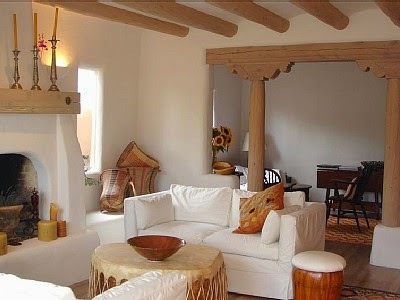 Houses made of all natural materials feel great to be in and there is no need to worry about any offgassing. However there are precautions that should be taken to avoid mould. These types of builings might be best suited to dry climates so that there is no chance of mould forming. 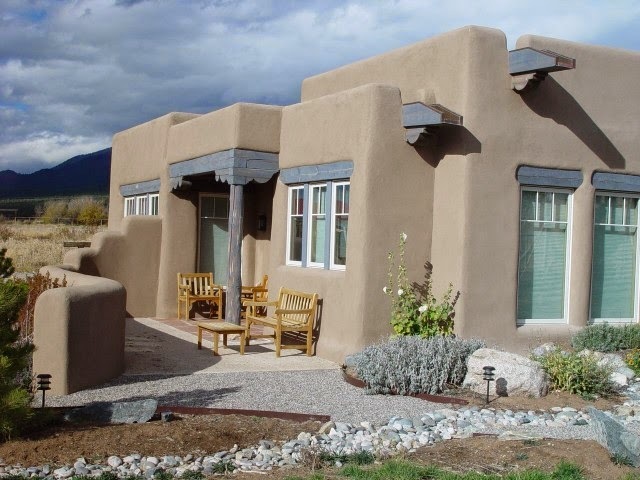 Some people seem to be doing very well in adobe houses in the south-western US. If straw is used in the walls it should be carefully sourced to be free of mould and pesticides. When building with cob, adobe or light clay straw there needs to be a dependable dry season of three months for the walls to dry out properly. They are particularly suited to be heated with wood stoves as that dries out the walls well in the rainy and damp seasons (source: Econest). An above grade stem wall and proper drainage around the house is also very important to keep the walls from getting damp. I'm hearing some bad stories of mould forming on cob and straw bale homes in cold climates. Another natural wall system worth mentioning in a little more detail, Rammed Earth, uses sand, gravel and clay and has had an interesting development recently. Foam has been added for insulation and steel for support, and 5-10% cement is added to the clay mixture. It's called Stabilized Insulated Rammed Earth. Water does not penetrate the walls, however concrete, espeically when not climate controlled is extremely prone to mustiness. Love this post. 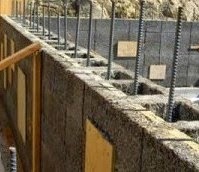 Aerated Autoclaved Concrete appeals the most to me. They can ship it to Canada but the trucking fee was significant. Thanks for sharing this post I really like it. I too was looking for this kind of wall idea.